The summer holidays are dragging on and Harry Potter can't wait for the start of the school year. It is his fourth year at Hogwarts School of Witchcraft and Wizardry and there are spells to be learnt and (unluckily) Potions and Divination lessons to be attended. But Harry can't know that the atmosphere is darkening around him, and his worst enemy is preparing a fate that it seems will be inescapable ...With characteristic wit, fast-paced humor and marvelous emotional depth, J.K. Rowling has proved herself yet again to be a master story-teller. 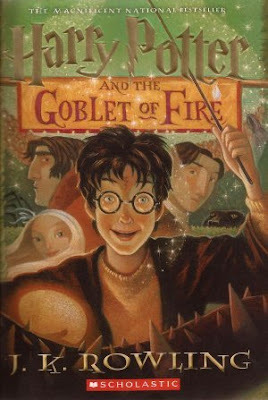 Harry Potter and the Goblet of Fire is by far the most eventful and exciting of the four books yet. This is also the book where the 'dursleys - school - heroic act - dursleys' pattern was broken, which made me so glad. I rated this book 4 stars when I first read it, but I'm rating it 4.5 stars now. I read this book years ago and have already forgotten most of the things that have happened, and in some scenes it felt like I was reading the book for the first time again, which of course felt magnificent. I loved seeing Sirius Black in this book again since he's one of my favorite characters. And most of all, I am anticipating all the exciting things that the reappearance of Voldemort will bring. The only thing that I didn't like about this book is how it doesn't feel like a single book. There two story arcs - the quidditch match and the tournament between schools, and I felt like there were so many things that was congested into this single book. Overall though, I still love this series with all my heart and will continue on with rereading the series.